I'm posting this on my dad's fancy pants tablets, laughing at him and his mouth of fire after he ate a dried chilli trying to be all manly! Anyhoo, I made soup for lunch, just a single serving. 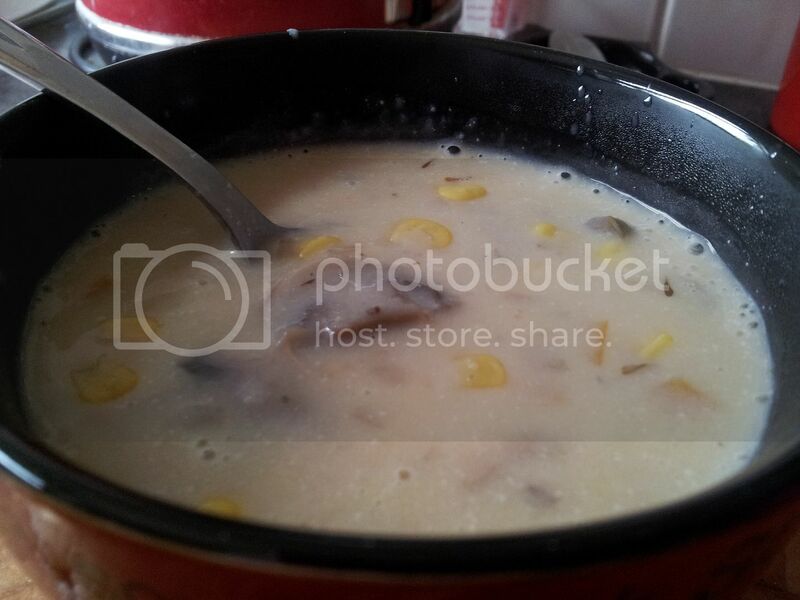 I was fancying sweetcorn chowder and this is what I came up with. I sauteed a shallot* in a bit of olive oil. Then I singled out the piddliest carrot in the fridge, peeled it and chopped it up small and chucked that in. Then some mushrooms then a stock cube and some water. Cooked it 10 minutes then added soymilk and salt & pepper and a bit of sweetcorn (what was left in my fridge, about a quarter of a small tin). I added a bit too much soymilk so I added a spoonful of instant potato powder to thicken it up a bit. I had it with some bread that was leftover from breakfast. Good! And on to dinner, we bought food for tomorrow because my bro and his new wife get back from their honeymoon and will obviously want foodz. But didn't have much for today. So we decided to be lazy and get takeaway from our favourite Indian Restaurant, the Taste of India, in our village. They are lovely in there and the food is always great. I had my usual which is a mixed vegetable tabaq and mushroom rice. 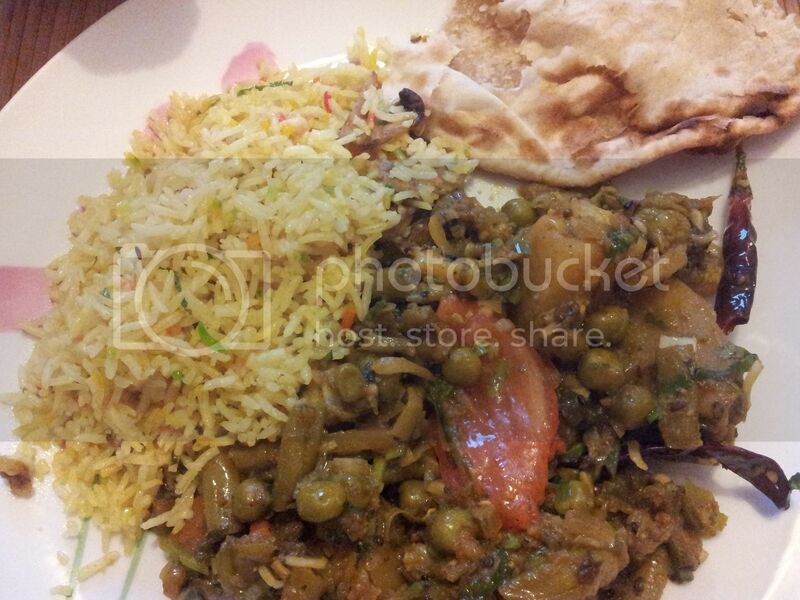 A tabaq is not a saucy curry and this one has loads of veg in like potatoes, peas, mushrooms and fresh tomatoes. And of course a buttload of dried chillis. It is usually not as spicy as it was tonight (especially if you don't eat the dried chillis like my dad!) but tonight it was pretty nippy, which I approve of. Also, because the owner likes us, he chucked us a free roti too, win! I'm happily full and am now off to watch x-factor and drink some wine. *I forget exactly where, but I think it was the PPK where someone was intimating that people who cook with shallots are a bit wanky (I'm paraphrasing). Well I love shallots, wanky or not because sometimes, especially when you are only cooking for 1, you just don't need a whole onion, dammit! So... RASP! Jog on! Love the impromptu iron cheffy soup. This is my first visit to your blog. Love your fun writing style. You make me want to fly f-bombs and drink wine. Kudos! True! An onion can be pretty big, and it is annoying to have to store it in the fridge in a container and all. Your soup looks great. I think I'm going to have to get a soup bowl lie yours. I'm sure it makes soup much more interesting. 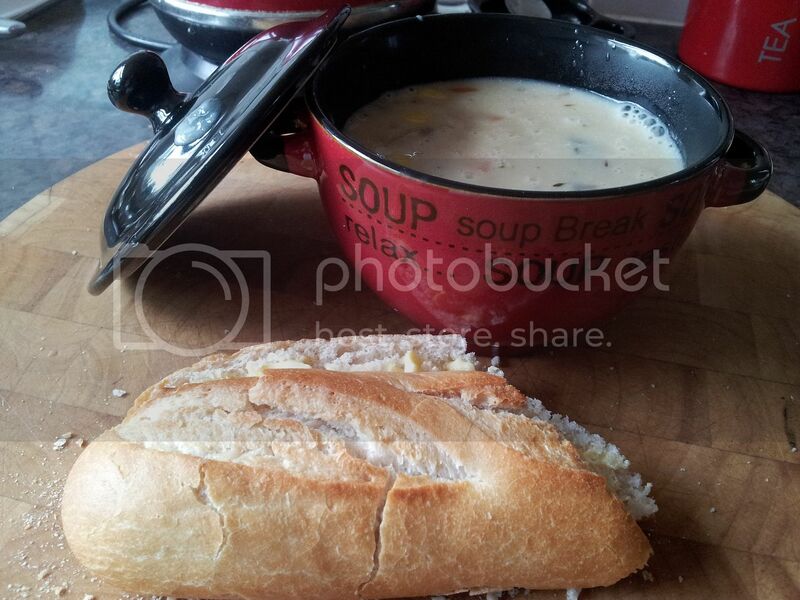 That is a tasty looking bowl of soup! And that crusty bread - WANT!! I love corn chowdery soups. Cute bowl.